Hi guys! 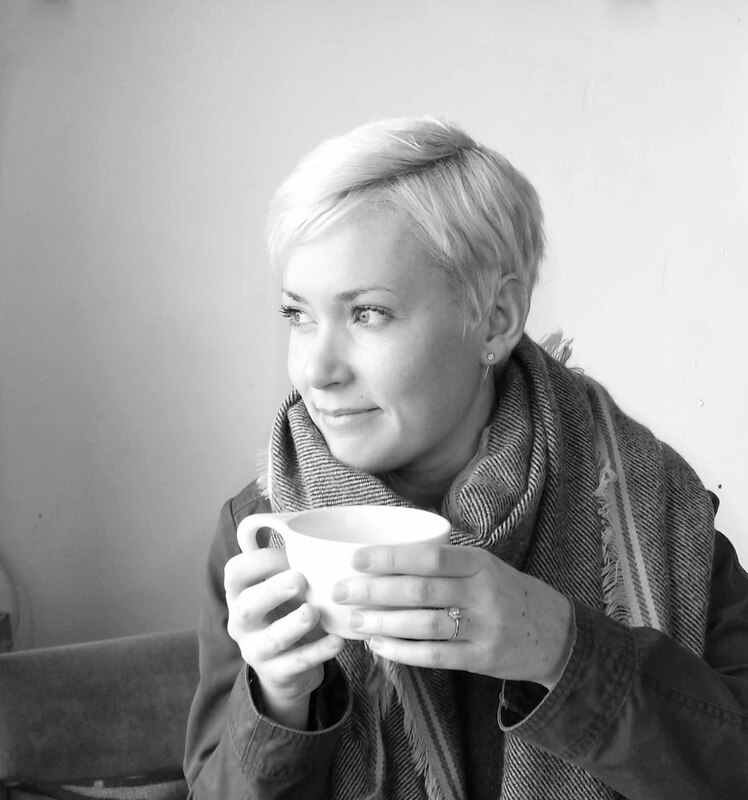 It's been awhile, but I'm finally back to the blog! It's been quite an interesting year for the 11th apartment. 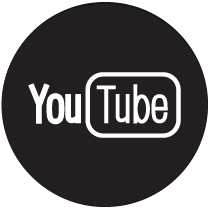 For one thing, my YouTube channel is doing very well; my latest hand lettering videos have really helped me to expand my audience. 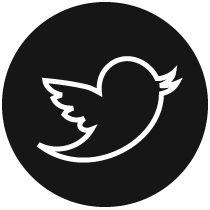 Which is awesome because it is so easy to get lost in the blogosphere! But on the other hand, I haven't been consistently posting on the blog (and one of my number one goals for the 11th apartment is to have consistent content). The excuse reason for this is that Chris and I are 'on the road'. As I mentioned back in June, we packed up our apartment (and our life) in Toronto and drove out east to spend a summer living and working on the coast. We had a fantastic season on Prince Edward Island; it was all about being outdoors: campfires, beaches, hiking and foraging. I loved the seasonal produce (and I tried my best not to go over-board with the canning, but that was pretty much hopeless! ), the fresh seafood and the endless ocean and coastline. The abundance of the land was so exciting and one of my favourite summer projects was my rose petal jam, made from foraged wild roses. It was just the best freaking summer! After leaving the island in early October, we traveled cross country to Banff, Alberta. We drove through the United States and made our drive into a camping road trip adventure, with stops in the mountains of Wyoming and Montana. I just love autumn camping! It's so cold, but it's beautiful too. (And there's no one else around!!). Well, now we're settled in Banff (both of us are employed by the same business again) and I'm busy working on the blog! 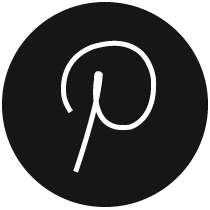 I've got lots of new craft posts in the works and quite a few fun Christmas ideas as well. The first of these crafty goodies is my dreamcatcher with leather feathers. 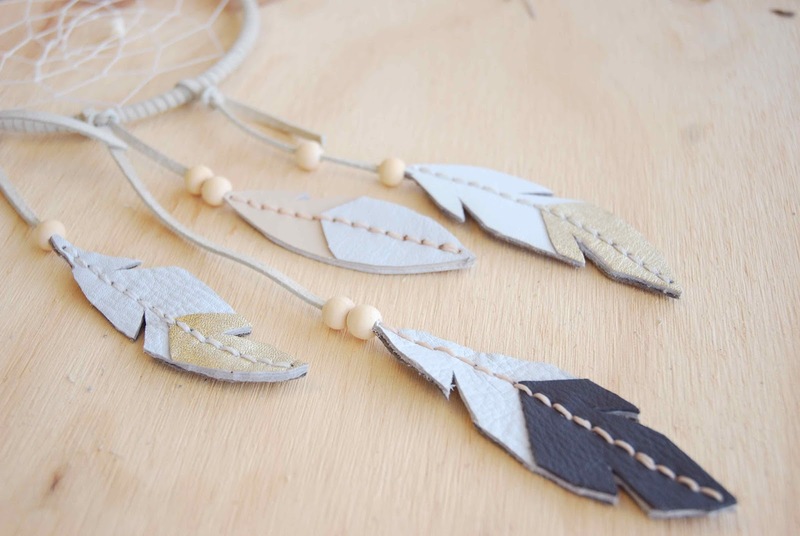 I love how this dreamcatcher turned out; if you use light coloured leather lace and pastel suedes and leathers to create the feathers like I did, the finished product is so stylish and modern looking. 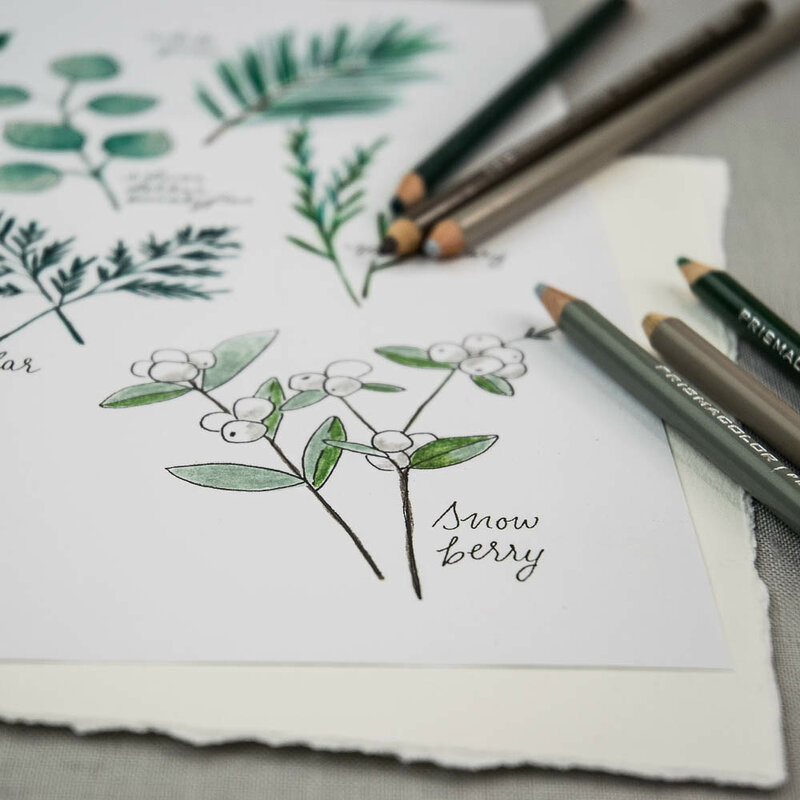 It's the perfect accessory for any room, from a nursery to a lounge. 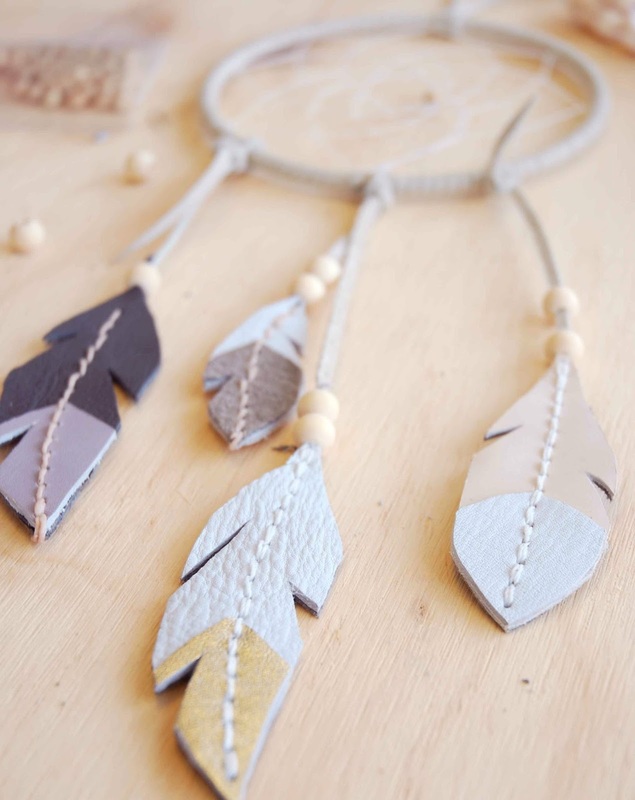 You could also try working with browns, blues and earth tones to create a really natural and rustic looking dreamcatcher. The supply list for this craft is fairly approachable. 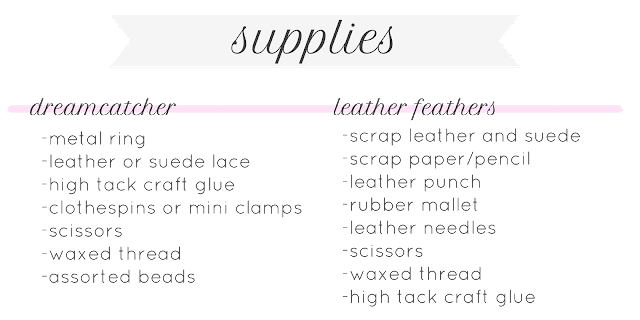 Most of the supplies can be gathered with one trip to the craft store and one trip to the fabric store. 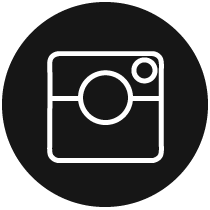 However, there are a few things on the list that you may not be familiar with if you haven't worked with leather. 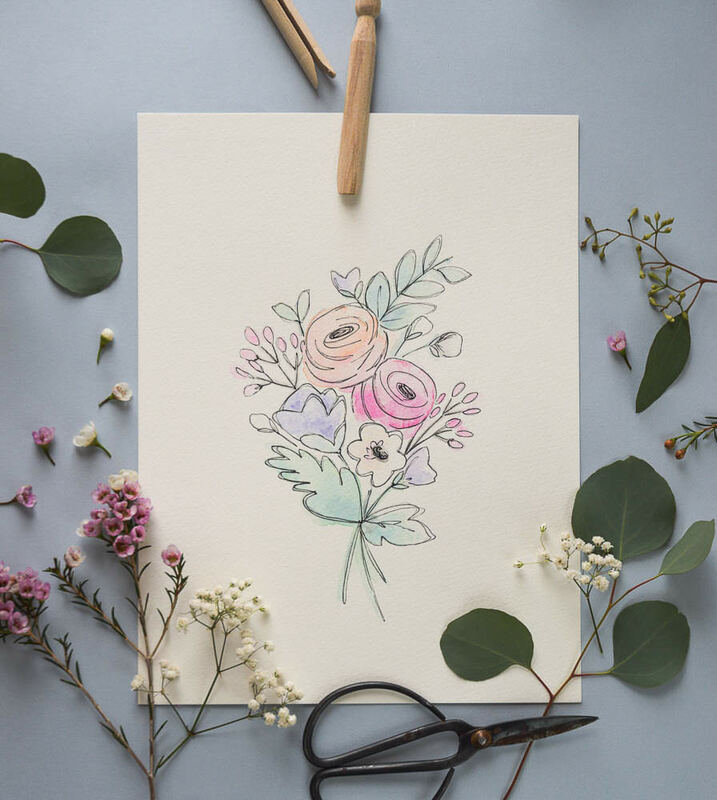 A leather punch, waxed thread and leather needles are all specialty items, and while many craft stores and many fabric stores will carry some or all of these items, if you do have any trouble finding them, simply check out Tandy Leather online. 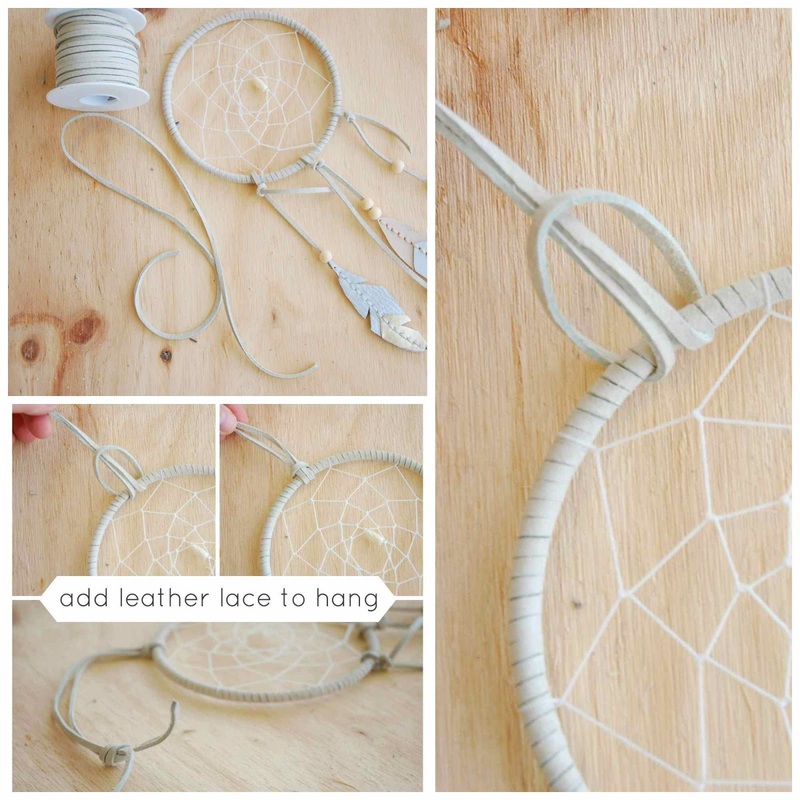 (Tandy, a leather working supplier, also sells leather lace and metal rings specifically for making dreamcatchers). Start by choosing your colours from small scrap pieces of leather and suede. It's a good idea to incorporate thinner materials, like suede and lambs leather, so that your feather doesn't get too bulky . For most of my feathers I used 5 lb leather for the front, thin suede on the back, and a delicate lambs leather for the colourful tip. You don't need to know a lot about leather to create these feathers, just avoid using three really thick samples and your feather will come together nicely! Next you'll need to design a feather template (using scrap paper) that is the shape and size you want your feather to be. Just make sure to have a thin bit of 'quill' at one end of the feather, as this is where you'll attach it to your dreamcatcher later. Cut out your template, pin it to a piece of leather and cut around it. Next, pin the new leather cutout to a second piece of leather and cut around that. 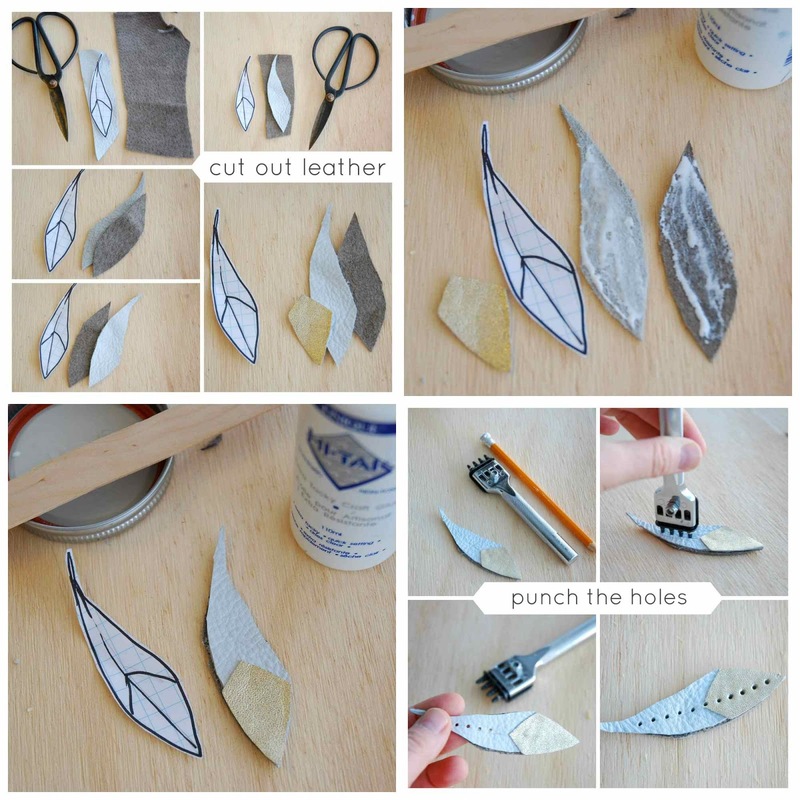 Finally, use either the paper template or the leather cut-out to trace and cut out the feather's tip. Glue all three pieces together using high-tack craft glue (available at fabric/craft stores); leave your feather to dry for at least two hours. (Oh, and don't worry if the cut-outs don't line up perfectly, you can trim the feather later). Once the glue has dried, it's time to start leather working! As I mentioned above, you don't need a lot of specific leather working tools for this craft. 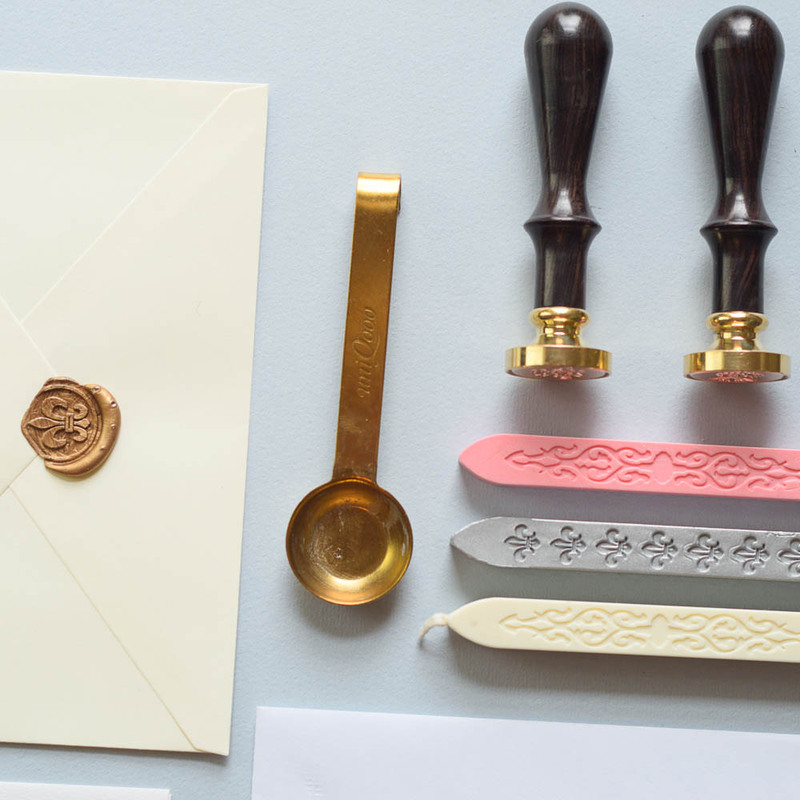 Get your mallet, pencil, and leather punch. (In the above photos, I am using a 4-in-1 punch, which just means that my punch will punch out four holes at a time. You could use a a 2-in-1, a 3-in-1, or whatever. You get the idea! However, I don't recommend that you use a single hole punch, because you'll also need to purchase a hole punch guide to go with it. The multi-hole punches act as their own guide, and that makes evenly spacing the holes an easy task. Next, use the pencil to draw a line down the length of the feather where you want the 'quill' to be. It can be a straight or curved line, anything goes. Next, press the leather punch firmly into the leather along the pencil line, so that you can plan out where you will be punching the holes. To begin making the holes, place the leather feather on a cutting mat or board, line up punch, and then hit the top of the punch firmly with the rubber mallet. I find it always takes me a few whacks to get the punch all the way through the leather. If you're unsure whether or not you've punched successfully, just lift the feather (with the punch still in place) and check that all the holes are fully cleared. Finish by punching holes down the length of the feather. To finish creating the leather feather (I'm not gonna stop rhyming, so just go with it), all you need to do is stitch the holes that you punched. This is seriously the easiest sewing project ever! It reminds me of weaving crafts that I did in nursery school; all you have to do is follow the punched holes. Super simple! And super fun! (If you're five years old). 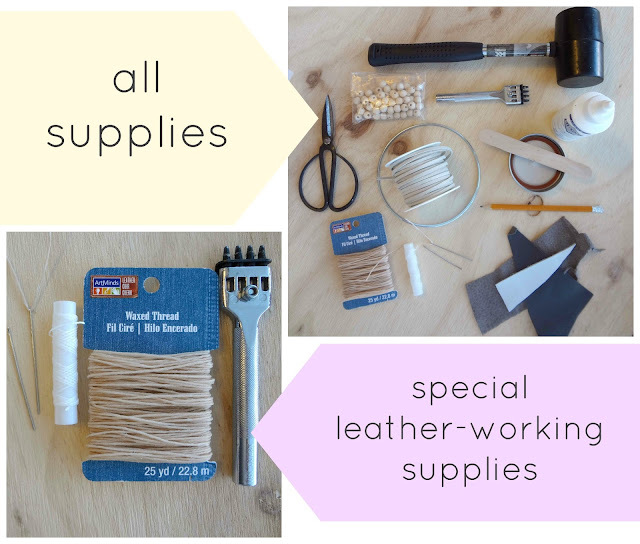 Anyway, grab the remainder of your leather working supplies: waxed thread and two leather needles. The stitch that you're going to do is called 'saddle stitch'. It's a very strong stitch, strong enough for cowboys, but perfectly lovely for leather feathers. (I really can't even help it). Cut a piece of waxed thread that is about twice as long as your feather. Thread a needle onto each end of the waxed thread. (This is probably the hardest part of the whole project! Threading two needles just seems cruel, but trust me, it's worth it.) 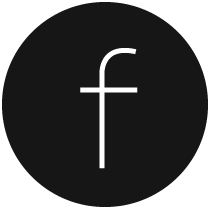 Poke one needle through the first hole and pull until the leather feather is at the centre of your thread. Now let me teach you the age-old saddle stitch... just take one needle and thread it in and out, in and out (as you would for any sewing project) until you reach the end of the feather. Then take the second needle and thread it in and out, in and out, as usual. And that's all there is to it! The second needle and thread will fill in the gaps left by the first, and you will have yourself a tough interwoven stitch that looks awesome! If you're using a thinner variety of waxed thread, at this point you may notice that the punched holes don't really look 'filled'. If this is the case, just take each needle and thread and sew back along the quill, going in and out of the holes that you just filled. This will give you a double stitch that looks super and makes a very good feather quill. In this photo both outer feathers are double stitched, while the middle two are single stitched. To finish, just sew back one stitch and trim the waxed thread. Then trim around the edge of your feather, so that all three pieces of leather are even and the sides are straight and flush. Finally, you can make a few cuts to give your feather a more natural shape. To make the dreamcatcher, gather your metal ring (available at leather working stores and craft supply shops), leather lace, craft glue and a few clips or clamps. The first step is simply to wrap the ring with the lace. Run a bead of craft glue along a small section of the metal ring, then begin to tightly wrap the lace around and around. Clamp the lace in place as you go (I used clothespins to do this, but mini clamps would also work well). Continue adding glue and wrapping the lace until you reach the place that you started. Add a clamp, trim the lace, and allow the ring to sit for an hour while the glue dries. Next it's time to weave the dreamcatcher. For this you can use waxed thread, artificial sinue or even embroidery thread. To begin the weaving, cut a length of waxed thread (for a 10 cm ring I needed about 2 meters of thread) and tie the thread on to the ring next to the spot where your lace started/ended. Later on you'll cover this part of the ring with the lace hanging tie. I'm not even gonna try to teach you how to do the weaving. It's not overly difficult but I'm really not good with anything that involves knitting/weaving. Chris and I always joke that I should make a knitting tutorial video for Youtube where it's just me throwing my knitted knot on the floor and stomping on it. However, with that said, even I was able to learn to weave the dreamcatcher. It's quite straightforward and after one failed attempt, I had it down. So don't be afraid! If I can learn it, I have total faith in everyone else! Click here to see the video tutorial that I learned from. The bead in the centre of the dreamcatcher represents the spider at home in his web, so as you come to end of your circle weaving, you may want to string on a single bead. I was going for a pretty minimalist look, so I used an oval shaped camel bone bead on one dreamcatcher, and a tiny wooden sphere on another. 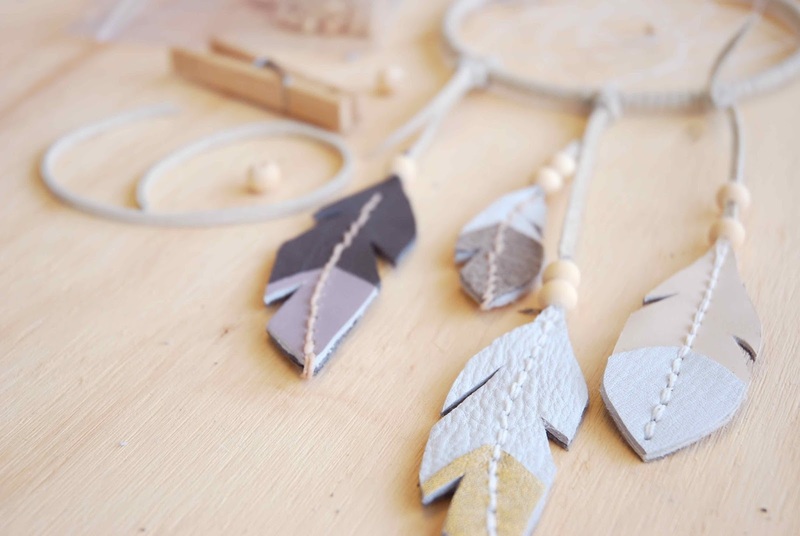 When your weaving is complete, it's time to add lace for the leather feathers to hang from. Cut three pieces of lace, anywhere from 30-50 cm each (depending how low you'd like your feathers to hang). Loop the lace through the ring and tie one side of the lace around the other. When this is done, you should have six pieces of hanging lace. 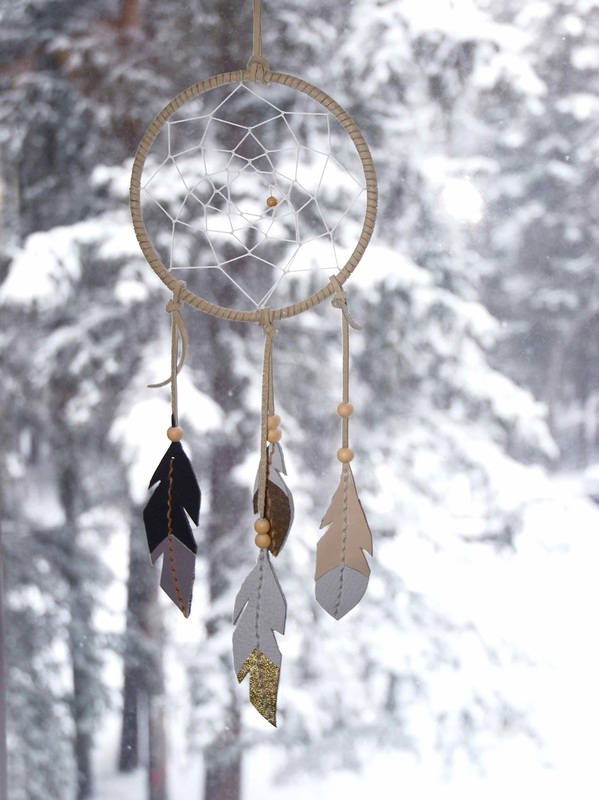 Next, decide how many feathers you'd like to have on your dreamcatcher. Six lengths of lace means you can have up to six feathers, but three or four looks great. 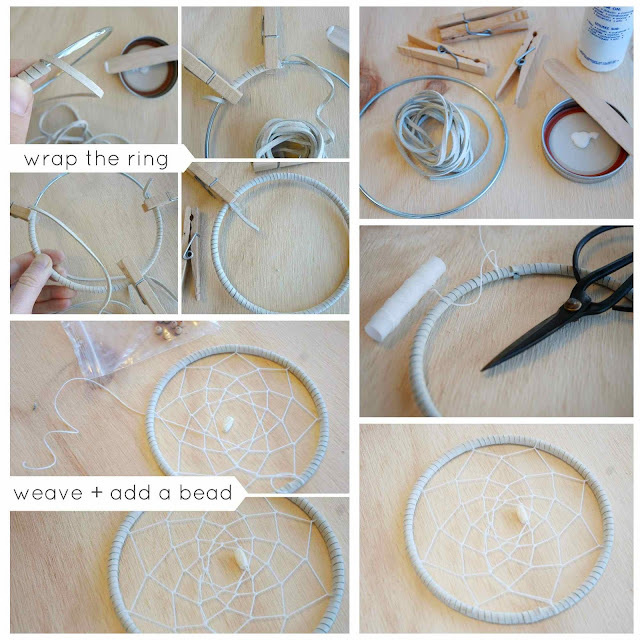 Lie the dream catcher out on a table with the lace spread out as it would hang. 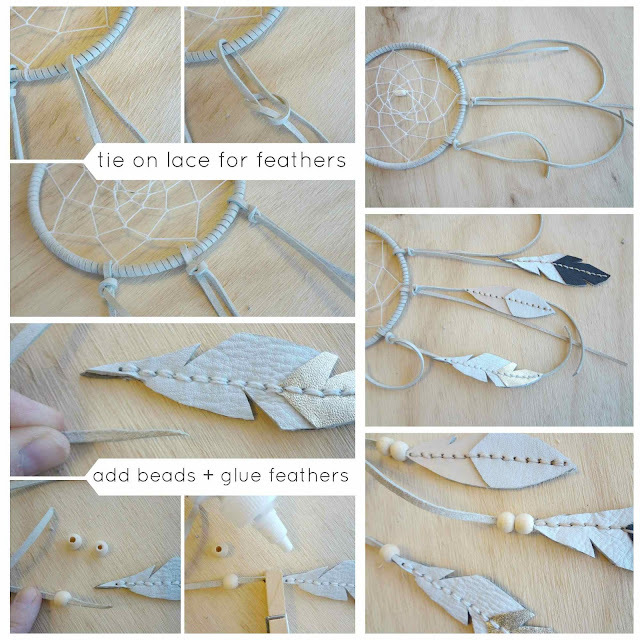 Try to arrange the feathers the way you would like them to look when the dream catcher is hanging up. Place the feathers all in a row, or at slightly differing heights, whatever you think looks best. 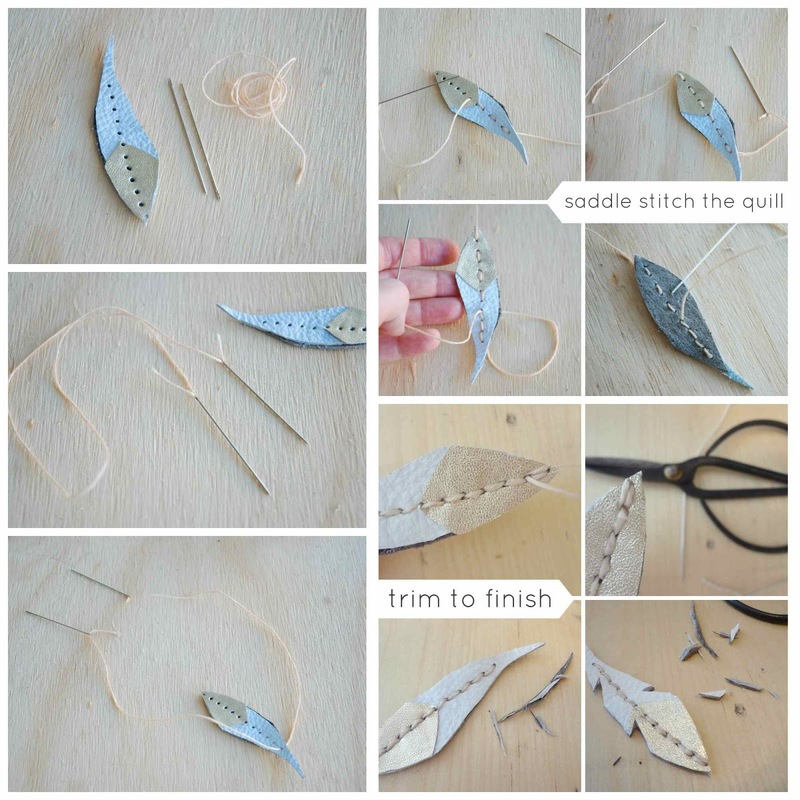 Cut each lace at the spot where you placed each feather. Before securing the feathers, you'll want to add some beads. String a few beads on to each piece of lace. If the beads are small (like mine were), you may need to trim the width of the lace to a point to allow the bead to slide on easier. You can use any kind of bead and add as many or as few as you like. If you want a look that is similar to mine, try using unfinished wooden beads. Time to attach the feathers. Slide the beads up the lace and out of the way. Then join the end of each lace and the 'quill' end of each feather with a drop of high-tack glue. Clamp until dry; then slide the beads back down the lace to cover the spot where lace meets feather. (Beads with smaller holes will also help the feathers to stay attached). The final (and simplest) step is adding a tie to hang the dreamcatcher from. Cut a length of the leather lace and fold it in the centre. Then slip the folded lace through the ring and back through itself. Pull tight to knot it on the ring, then knot the loose end.